OpenAire retractable roofs offer community pools attractive designs, year-round reliability and significant savings on operating costs. For many years, building a customized community pool with a variety of features was only possible for large developers and owners, leaving smaller municipalities and parks to create only simpler facilities. Fortunately, it is now feasible and cost-effective for local communities to build and design their own indoor swimming pools that offer the same inviting atmosphere and community recreation as larger venues. 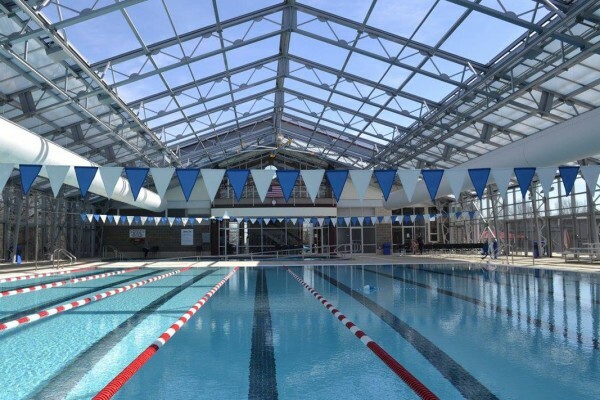 One major design feature has transformed dozens of municipal aquatic centers: an aluminum framed retractable roof enclosure from OpenAire. 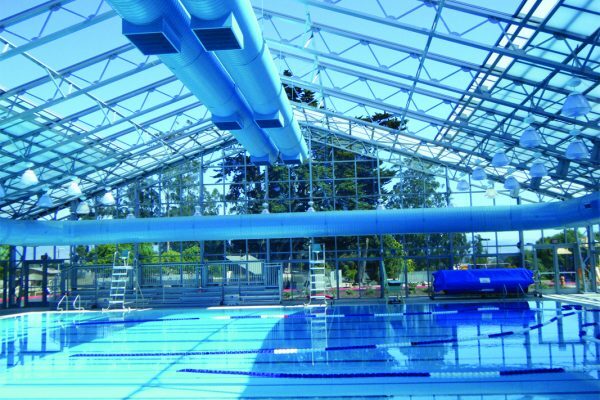 OpenAire enclosures offer pools, waterparks and other aquatic centers of all sizes the best of both worlds: the shelter and year-round reliability of an indoor facility, combined with the sunlight and fresh air of an outdoor park, as well as significant savings on operating costs compared to traditional structures. This is why many community pools and waterparks have discovered that with OpenAire, a little sky makes a world of difference. OpenAire has helped many local aquatic centers like these create unique, inviting and versatile facilities that go above and beyond the typical public pool. These community destinations can operate at reduced cost and attract patrons from many demographics throughout the year. Popular Arkansas community pools have experienced increased visitors, energy cost savings, and returns on investments (ROI) after opening customized OpenAire enclosures for their attractions. These venues include: Pocahontas Aquatic Center in Randolph County (population 17,469), an indoor/outdoor facility that includes pools and a waterpark; Clarksville Aquatic Center in Clarksville, AR (pop. 9,524), whose indoor pool is now able to offer competitive swim and SCUBA training in natural light without glare, while the family splash area offers a zero-depth entry for children and people of all abilities; Bryant Aquatic Center in Bryant, AR (pop. 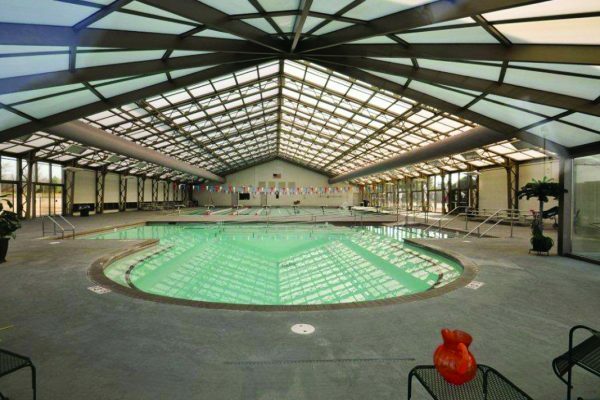 20,000), whose heated therapy pool and competitive lap pool have encouraged better fitness and healthy living in the town; Batesville Community Center and Aquatic Center in Batesville, AR (pop. 10,740), which offers the community both outdoor facilities and indoor water facilities located in an expansive 95 by 224-foot (28.95 by 68.27 meter) enclosure designed and installed by OpenAire; Heber Springs Community Center in Damascus, AR (pop. 379), which, despite its small size, has created a successful community pool that is a feature for visitors to the town; and the Paragould Aquatic Center in Paragould, AR. 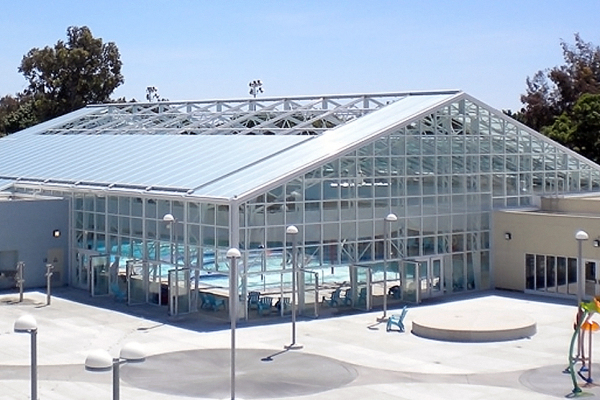 Equally popular community pools in California have benefitted from OpenAire’s solutions, such as: Allan Witt Aquatics Complex in Fairfield, CA (pop. 114,756), whose OpenAire enclosure not only allowed the previously disused structure to reopen, but has let the city create a greatly expanded aquatic program with everything from competitive swimming to a children’s splash pool; Central Park Aquatic Center (Mike Shellito Indoor Pool) in Roseville, CA (pop. 132,671), offering a variety of water fitness programs, swimming lessons, and lap swimming with an 8 lane, 25-yard-long pool; Lompoc Aquatic Center in Lompoc, CA (pop. 43,712), whose attractions include water slides, a lap pool, competitive pool, therapy pool and an AquaPlay structure; Mill Valley Aquatic Center in Mill Valley, CA; Richmond Swim in Richmond, CA, whose retractable roof was a vital part of restoring the aging indoor aquatic center after corrosion and pool chemicals caused the building to be closed; in Walnut Creek, CA, a vibrant fitness center with a lap pool, exercise pool and spa located in the heart of an inviting senior living community; and Salinas Aquatic Center in Salinas, CA, whose double-slope enclosure is not only cost-effective but also LEED Gold Certified. 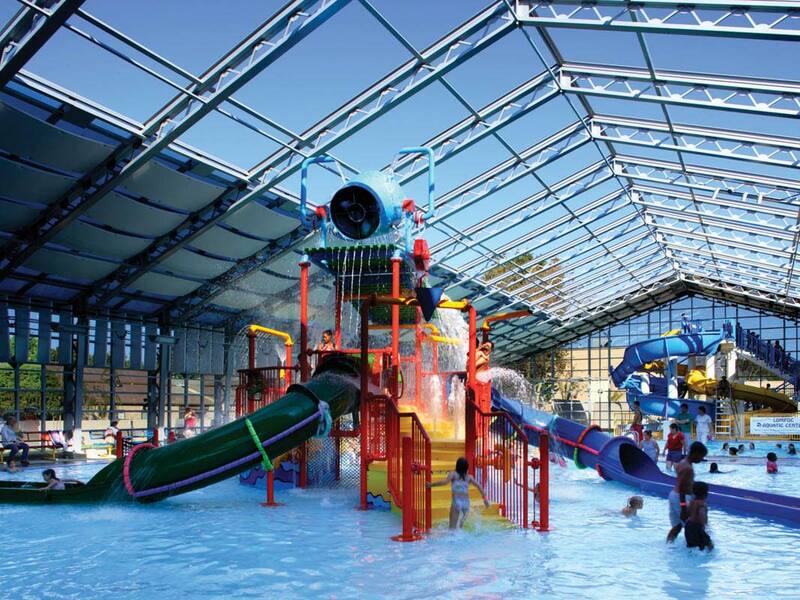 OpenAire retractable roofs and enclosures have also been thriving in these communities: AquaVale in Aylesbury, UK; Bahia Bocholt in Bocholt, Germany; Blattner Recreation Centre in Burgrienden, Germany; Blenheim Recreation Centre in Ontario, Canada; Brahn Spring Park in Huntsville, AL; Donetsk Aquapark in Donetsk, Ukraine; Epic Waters in Grand Prairie, TX (pop. 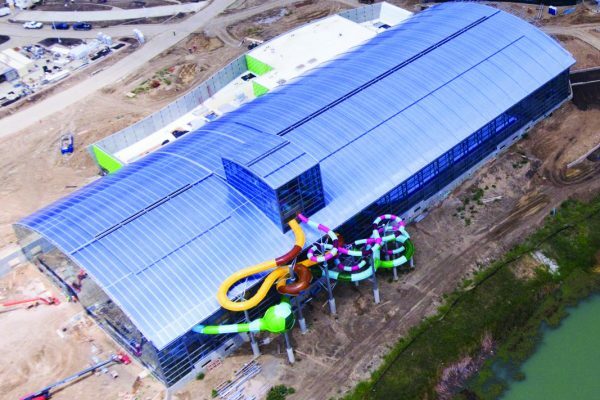 190,682), whose 62,000-square-foot indoor waterpark section will be a key feature of Grand Prairie’s Epic Grand Central, which will also include more than 172 acres of trails, fitness centers, a fully accessible children’s playground, and much more; Madison Recreation Facility in Madison, AL; Peterson Air Force Base in Colorado Springs, CO; Roger Carter Ellicott City, MD; and Rosemary Beach in Panama City, FL. With such a variety of communities opening their own unique and highly successful pool facilities with OpenAire retractable enclosures, almost any community can find new opportunities with a year-round retractable pool enclosure design. 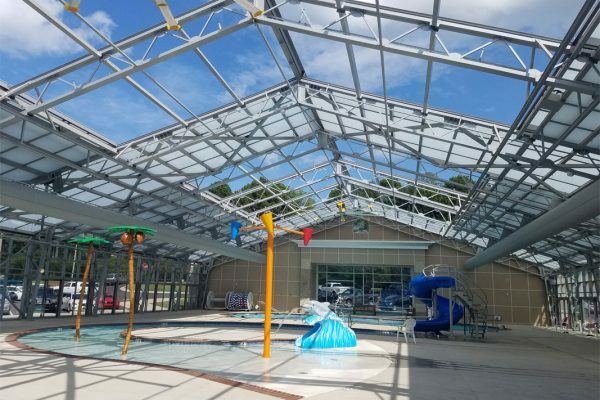 Paragould, AR (with a population of 27,465 and covering 81.2km2) is a terrific example of how OpenAire’s retractable roofs can bring great success to a small town’s community pool. The aquatic center was conceived as a redevelopment of the town’s aging community center. OpenAire’s retractable enclosure design was key to making the project possible. The town could not afford the cost of air conditioning, ventilating and maintaining a typical indoor aquatic facility. OpenAire’s retractable roof technology offers natural cooling, ventilation and lighting through much of the year, reducing expenses significantly and allowing Paragould to operate within budget. Independent studies have found that OpenAire’s waterpark and pool clients save up to 27% on energy and lighting costs compared to conventional structures. Effective financial planning was also essential in making Paragould’s development possible; an ongoing one-cent sales tax in the town played a major role in raising funds and avoiding excessive debt during development, and has since allowed Paragould to keep the center well-maintained and up-to-date. This innovative style of aquatic facility is not unique to Paragould; in fact, it represents a wider trend. According to a study in Recreation Management magazine by Deborah L. Vence, modern aquatic centers have “increased in popularity and use,” offering guests “innovative, first-to-market attractions” and multi-purpose facilities that can serve a variety of demographics. The center frequently exceeds revenue projections and has been highly beneficial to people of all walks of life; the local high school has been able to add swimming to its athletic program, while families and individuals of every income can enjoy the facilities thanks to Paragould’s very low admissions. Paragould has also partnered with Arkansas Methodist Hospital to use the center’s therapy pool for hospital patients as part of their recovery program, including a young cancer patient whose exercises in the pool eventually helped him walk on dry land without crutches. OpenAire is deeply honored to play a part in these success stories. These are only some of the advantages that community pools find when they choose OpenAire enclosures. OpenAire is always ready to bring this customized design solution to community aquatic parks in areas such as yours.